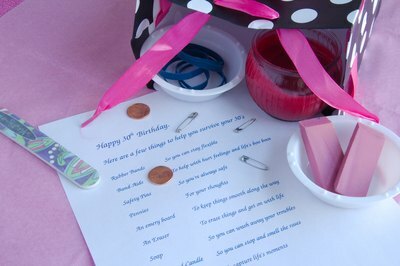 Birthday survival kits are fun to make, fun to give and fun to receive. Anyone can prepare a one -- and they can be as extravagant or as simple as you like. The nice thing about them, aside from the humor and sentiment, is that they let the recipient know that you care enough about him to put together a gift requiring your time, effort and thought. 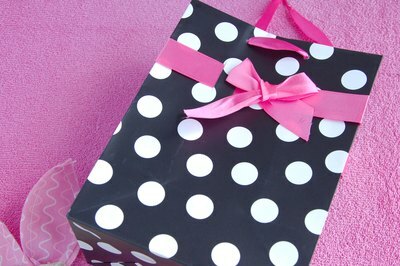 Find something festive in which you can assemble your survival kit such as a colorful gift bag, basket or decorative box. Purchase or locate appropriate items to put in the survival kit. 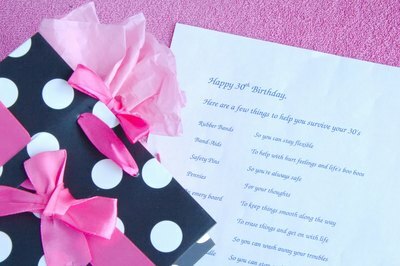 Attach a note to each item to convey the appropriate sentiment. Examples and their sentiments might include "a rubber band to help you remain flexible," "a Band-Aid to help with hurt feelings and life’s boo boos," "candies so that every day can be as sweet as you are," "a shot glass so you can call the shots," "pasta so life doesn’t pasta you by," "an Almond Joy chocolate bar so you can have joy whenever you need it," "a party horn to remind you to toot your own horn once in a while," "two cupcakes so you can have your cake and eat it, too," "marbles to replace the ones you lost and are still going to lose," "a safety pin so that you are always safe, "a bottle of wine because we all need to wine now and then," "pennies for your thoughts," "a package of wet wipes to clean up life's messes," "starch spray to smooth life’s wrinkles," "Silly String or Silly Putty to remind you to be silly sometimes," "lotion, cream or sandpaper to keep things smooth along the way," "an eraser to erase things and let you get on with life," "a 'do not disturb' sign since you need to put yourself first every now and then," "rubber gloves to help you get a grip," "a bar of soap so you can wash away troubles," "lifesavers -- no explanation needed," "a rose-scented candle so you can stop and smell the roses" and "a camera to capture life's moments." 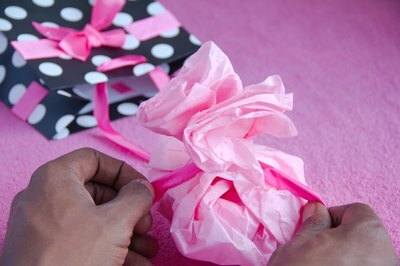 Wrap each item individually and put them all in the bag, box or basket.